It’s a big weekend ahead! On Friday, December 11th in the Woodlands Centre it’s ‘An Alternative Christmas Carol’ hosted by Colin and Katherine Macleod - a night of original music and festive covers featuring a line-up of local musicians. 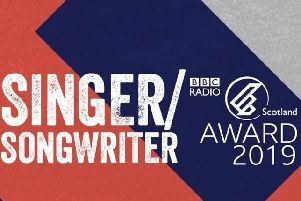 These include performers such as Neosa and Callum Macleod, Eleanor Nicolson, Jane Hepburn and The Dun Ringles and special guest headliner, the much lauded, Asylum Recording artist, Nottingham singer/songwriter Saint Raymond. His indie pop anthems were immediately tipped for big things by the music press and garnered attention from major labels in early 2013 after his debut ep, ‘Escapade’ (released on songstress Gabrielle Aplin’s Never Fade label) had entered the digital chart. With an affinity for ‘80s-inspired lush harmonies and off-kilter beats reminiscent of Vampire Weekend his track ‘Everything She Wants’ from 2014 ep Ghosts gained radio support from BBC Radio 1’s Zane Lowe, who featured it as the Hottest Record in the World on his show. Tickets for this event are on sale now from the Woodlands Centre. Each track is based on ‘piobaireachd’, the classical music of the highland bagpipes. Although the melodies that have inspired this album may be several hundred years old, the songs have been written in Iain’s very own contemporary style. Iain’s father is Iain M. Morrison, one of the world’s leading voices and tutors in the world of piobaireachd. Iain Snr was taught by the legendary Donald Macleod who also hails from the Isle of Lewis. On track 7, ‘Too Long in This Condition’, you can hear the voice of Donald Macleod and the canntaireachd of Iain Snr. The musicians featured on the recording of ‘Eas’ will be joining Iain at An Lanntair: Pete Harvey - cello, Gordon MacLean - bass, Lori Watson - fiddle/vocals and Joe Smillie - drums. Immediately afterwards, in the Sea Angling Club, “there’s the first and only George and Paul gig of 2015 and what a night they have lined up. They’re putting together an up to date EDM set with a focus on Tech Trance. As always they’ll be going in early to install a massive sound system and enhanced lighting rig, ensuring that an audio/visual assault takes place on the senses, generating that perfect club atmosphere. And you have got to listen to/buy the superb new album ‘Snow Fled’ from Vapour Night (local artist Ali Murray at: https://vapournight.bandcamp.com/album/snow-fled). Opening track ‘Godless’ starts with an edgy synthesized rhythm figure that bursts into an atmospheric mix of majestic ringing guitars and a distant calling vocal giving the track an expansiveness as big as the cosmos. ‘Blinding White’ is all powerful slashing guitars and incessant pounding drums with a dreamy subliminal vocal and we are clearly in uber-shoegaze heaven. ‘Scandinavia’ is a short, bell-like instrumental reprieve before the grinding guitar Pop, sound collage of ‘Ancient Youth’. ‘Breathing Life Into You’ is the perfect title for the ethereal electronica of this image provoking instrumental. ‘House of Water’ is a beautifully lush, understated study in hypnotic, electronica that instantly grabbed me, wouldn’t let go and nearly took my breathe away before it gently slipped into the gorgeous and delicate ‘Snow Fled Pt 1: Winter Lullaby’ and off into the whirling, swirling, cinematic, call of the wilds, eight-minute finale of ‘Snow Fled Pt 2: The Never Ending Wilderness’. Really enjoying this collection of songs, which just may be his best yet! Pictured is the Snow Fled Cover, painting by Helen Carter.